Recently, one of our active Facebook fans posted a mystery photo (on left) and asked why her purple LabColors didn’t go purple. I suggested that perhaps diluting the LabColor rather than using it straight would fix the issue. And voila, fixed (right side). The reason for this is simple: LabColors are crazy, insane concentrated FD&C (Food, Drug & Cosmetic) and D&C (Drugs & Cosmetics) colors blended in a small amount of liquid. We’ve deliberately made the colorants ultra-concentrated so you’re not shipping water. So there’s an extra step for you at home but judging from the photos above, it’s definitely worth it. Some of the colors are super gloppy and tend to sink or stick to the bottom of the container so if you use them directly out of the bottle, they can spot strangely (glop glop) or not go the color you want because you’re not getting the full mixture. 1. Heat distilled water in the microwave in a sterilized (5% bleach water will do the trick) heat-safe container until 140 degrees or warmer. If you’re heating the colors in a plastic container, we recommend using a hot water bath so the plastic won’t melt. For the Small bottle size of LabColor (10 mL), you can dilute between 4 to 8 ounces water. I prefer to work with 4 ounces of water for an ultra concentrated and non-clumping color. This is a personal preference thing. I know one other professional soapers that prefers 8 ounces, so play around with it until you get the perfect dilution. Start with 4 ounces and work up. 2. Mix the colorant into the water and rinse out the colorant bottle to get all the last dregs of color. Shake well. 3. You can either refrigerate the diluted Labcolors or add an effective water soluble preservative at 1% (Germaben or Optiphen ND is my preference). And that’s it – it’s super simple! Thank you to Courtney for posting the mystery for us to all learn from. If you store your color in the fridge do you have to add the preservative. Thanks so much Anne-Marie for mentioning me and my blog! Can the lab colors be used in liquid soap as well? It’s always hard to find ones that work right, so these would be awesome to get more color variety! Anything that’s clean and sterile will work great but I like clear bottles so you can see the colors at a glance. Would you recommend any particular bottles to store the diluted LC? =) Always happy to help when it comes to soap or business! You’re welcome – it’s a really simple step but easy to miss and then end up with soap that you didn’t quite intend. I agree – they last a long time! I did the same thing. I didn’t know about the dilution and then I actually read the website and ordered a whole set of LabColors and went through a whole afternoon preparing them in this fashion. It was well worth the effort and today more than a year later I still have plenty of color left. 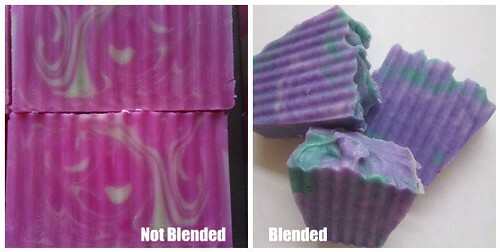 Labcolors are wonderful and I have been really happy with them in CP soap as well as MP and HP! Wow – quite the difference! Thanks for the easy how-to on diluting. That’s really useful and good to know–thank you for the tip!! Although the first color is still neat, I see what you mean now.